We learned 2 things in the Star City: First of all, the Cleansing is the event in which the High Ones absorb the collective consciousness of a civilization to create a new High One from it. Secondly: The Numinos is the consciousness of a High One. Magistra Yaela assumes that we can get one by using the Word of the Dead which the Aged Man left behind - most likely in the The City of a Thousand Floods where the cleansing of the Pyreans happened. But as we left the archive we met a hysterical Kurmai. He blamed us for the disappearance of the Ancient Fathers and set off an alarm, which cost both his and Magistra Yaela's life. Now it is up to us to find a map to the City of a Thousand Floods and to escape from the Star City. After escaping the mechanical beast, you and your companion wind up in the same room you were in before. When trying to run further back, the door shuts, and both of you get trapped. Your companion suggests searching for a hidden exit. 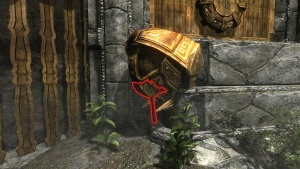 There is a small lever in the middle of a golden head near one of the side walls. Pull the lever and a hidden passage will open. It leads to the Botanicum. Enter it, and upon walking further ahead you will enter a clearing, where you will be attacked by several Starling Guardians and Spiders. There are orange trees in the area, so if you are low on health, you can stock up. Continue, and your path will be blocked by a Starling Centurion. Take care of it, and exit the Gardens using the door in the south, atop the platform. Once outside, you will find that the starship is missing, and you cannot escape the city just yet. After speaking to your companion, you will decide that the best course of action, is to shut off the alarm. 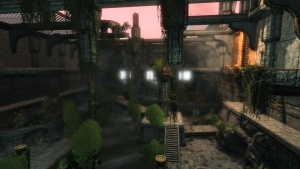 Return to the garden, but this time, climb up the platform on your left. You will find a door there, which leads to the workshop. 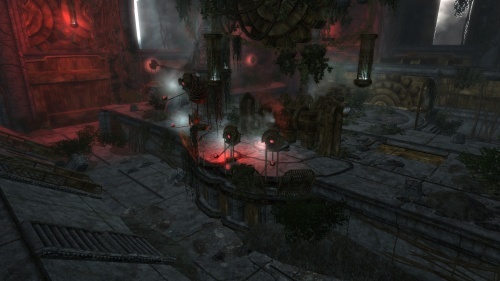 Follow the long corridor, fighting off any spiders, centurions and guardians in your path, and climb up the platform to enter the upper level of the workshop. There, you will have to do more climbing and fighting, but once you reach the top, you will see a room with a pulsating red crystal. You must attempt to reach it, but be careful, as the doors to your left reveal hidden Starling constructs which attack you. Once you finally approach the crystal you will have to touch it, but be prepared to run, as touching it activates yet another security measure - an electrical shockwave which can easily kill you. Try to avoid it as best you can, until a hidden passage in the center of the chamber opens up. There, you will find your other companion. They will explain that they weren't on the starship when the Starling Bird attacked, that's why they're alive. They will also allude that they have some information about where the map is located. Follow them across long hallways. You will reach a small clearing where you will encounter the Starling Bird once again. Do not try to fight it, just run to the next room with your companions. Once inside, your companion will explain, that your way out of the city is to step inside an escape capsule and let yourselves drop down back to Enderal. You should hurry, as you will only have 220 seconds to find the pyrean map and step inside the capsule before the Starling Bird breaks through the door and kills you. 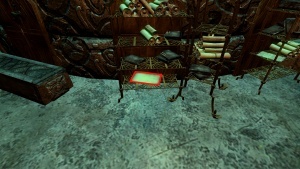 The world map is on one of the shelves near the centre of the room. Grab it, and rush to the capsule. Open it by pushing the blue button in front of it and sit inside. 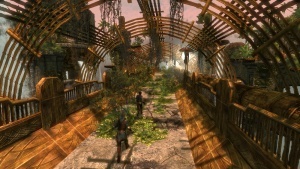 You will then drop down to the snowy mountains of Enderal, near the Living Temple. Find your companions in the snow. The one you are in a relationship with, or have a higher affinity with, will be okay, but your other companion will be severely injured, and will have to be taken to Ark to heal. You will then teleport to the Sun Temple to discuss your findings with the rest of the Order. Once that is done the next quest, For the Greater Good, will start. This page was last modified on 9 May 2017, at 17:59.